The Sri Lankan Commissioner General of Essential Services, S.B. 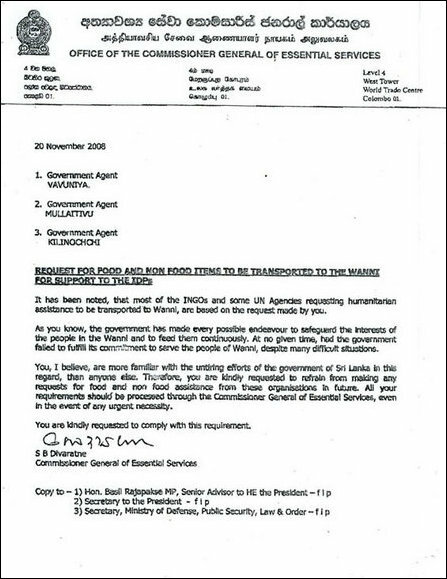 Divaratne, in a letter issued to the Government Agents of Vavuniyaa, Mullaiththeevu and Ki'linochchi last month has instructed the GAs to refrain from making any requests for food and non food assistance from INGOs and UN Agencies. "All your requirements should be processed throgh the Commissioner General of Essential Services, even in the event of any urgent necessity," the letter states. The content of the letter, which is interpreted as a threat to the Tamil GAs, is also document of evidence for how a structural genocide is being inflicted upon the Tamil people, an official serving under one of the GAs told TamilNet. A copy of the letter was sent to Basil Rajapaksa, a national list MP and advisor to his brother Mahinda Rajapaksa and to Gotabhaya Rajapakasa, another brother of Mr. Mahinda Rajapaksa and SL Secretary of Defence. Recently, Colombo was irked by a statement of a World Food Program (WFP) official, John Campbell, who reported from Tharmapuram in Vanni to the BBC that conditions in Vanni were "as basic as in Somalia." "Any Government Agent charged with the responsibility of caring for refugees should try whatever means available to him or her, to obtain humanitarian aid. Depriving them this right is a war crime," the official who supplied the document to TamilNet said.